It's so easy to gravitate towards neutrals during the winter months...they are easy staples that can be paired with just about anything. 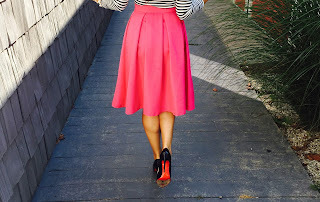 I absolutely love this heather grey fit and flare skirt. It's a great staple that looks pretty with brights like my orange sweater above, or pastels like pale pink or cream. Give grey a whirl this season... its a great staple that looks so pretty with so many colors.